Ontario’s Government for the People is fulfilling its promise to put the Province on a path to fiscal balance in a responsible manner, with a balanced budget projected for 2023–24. The government is returning to balance by improving the way that services are delivered and focusing resources on individuals and families who need them the most. Restoring fiscal sustainability to the Province’s finances is in the public’s interest and will ensure Ontario’s hospitals, schools and other critical public services are available for generations to come, protecting what matters most to the people of Ontario. In August 2018, the Independent Financial Commission of Inquiry (Commission) concluded that the government had inherited a deficit of $15.0 billion for 2018–19 from the previous administration. Building on the Commission’s recommendations, and taking into account higher-than-forecast revenue as well as actions and decisions to reduce spending, the government is now projecting a deficit of $11.7 billion in 2018–19, a $3.3 billion improvement relative to the Commission’s baseline deficit forecast. Over the medium-term, the government is projecting steadily declining deficits of $10.3 billion in 2019–20, $6.8 billion in 2020–21 and $5.6 billion in 2021–22. Through a comprehensive multi-year planning process, the government has found efficiencies and is delivering additional savings beyond the 2018–19 fiscal year while providing relief to Ontario individuals, families and businesses. Net debt-to-GDP is forecast to be 40.7 per cent in 2019–20, lower than the Commission’s revised baseline for 2018–19, before decreasing to 40.6 per cent by 2021–22. The government is committed to restoring the Province’s fiscal health by putting Ontario on a path to balance the budget in a responsible manner — restoring trust, transparency and accountability. Interim represents the 2019 Ontario Budget projection for the 2018–19 fiscal year. The decisions of the previous government left Ontario with the world’s highest subnational debt, a growing deficit and an ongoing dispute with the Auditor General of Ontario concerning the Province’s accounting practices. By taking immediate action, Ontario’s Government for the People has taken steps to reduce the deficit from the inherited $15 billion to $11.7 billion for 2018–19 and received a clean audit opinion on the Public Accounts for the first time in three years. The following sections detail the actions taken by the government since June 2018 to reduce the 2018–19 deficit by $3.3 billion and outline the government’s medium-term outlook for Ontario’s finances. To restore accountability and trust in the Province’s finances, one of the government’s first actions was to establish the Independent Financial Commission of Inquiry (Commission) to look into past financial practices, specifically accounting practices and to provide advice on the Province’s budgetary position for 2018–19 as compared to the fiscal position presented in the 2018 Ontario Budget. Table 3.2 provides a breakdown of the Commission’s adjustments to the 2018 Budget plan for 2018–19. For additional details on the Commission’s recommendations, please see https://www.fin.gov.on.ca/en/report/ifci-2018.pdf. The government is projecting a deficit of $11.7 billion for 2018–19, which is an improvement of $2.8 billion compared with the forecast provided in the 2018 Ontario Economic Outlook and Fiscal Review (2018 Fall Economic Statement). On November 15, 2018, the government published its first fiscal and economic update with the release of the 2018 Fall Economic Statement. The outlook demonstrated the government’s immediate actions to drive efficiencies and ensure value for every taxpayer dollar. This resulted in tax relief of almost $2.7 billion to families and businesses in Ontario along with savings of $3.2 billion. The net impact of expenditure management decisions and the tax relief reported in the 2018 Fall Economic Statement reduced the deficit to $14.5 billion, or $0.5 billion less than the inherited deficit reported by the Commission. As presented in the 2018 Ontario Economic Outlook and Fiscal Review. Revenue is estimated to be $150.8 billion, or $2,551 million higher than forecast in the 2018 Fall Economic Statement plan. Interest on debt expense is projected to be $9 million lower than forecast in the 2018 Fall Economic Statement due to lower-than-forecast interest rates. Total expense is projected to be $744 million higher than forecast in the 2018 Fall Economic Statement, primarily due to investments in health care, postsecondary education and training, and support for municipal modernization efforts. As recommended by the Commission, the 2018 Fall Economic Statement included a $1.0 billion reserve to protect the fiscal outlook against unforeseen adverse changes in the Province’s revenue and expense forecasts in 2018–19. The reserve is not required for year-end and has been drawn down, thereby reducing debt that the government would otherwise have incurred. Given the preliminary nature of these estimates, the interim forecast is subject to change as actual Provincial revenue and expense are finalized in the Public Accounts of Ontario 2018–2019 to be released later this year. Total revenue is estimated to be $2,551 million (1.7 per cent) higher than the 2018 Ontario Economic Outlook and Fiscal Review plan (2018 Fall Economic Statement). The estimates are based on revenue information available to March 8, 2019. Information arriving subsequent to this date will be reflected in future updates, such as the Province’s audited financial statements in the Public Accounts of Ontario 2018–2019. Corporations Tax (CT) revenue is $1,430 million higher due to stronger business operating profits and higher amounts from processing 2017 tax returns. Sales Tax revenue is $1,192 million higher largely due to higher levels of household spending in 2017 and 2018. All Other Tax revenues combined are $29 million higher. Government of Canada revenues for funding Infrastructure projects are lower by $924 million due to revised timelines for major projects. Revenues from All Other Federal Transfers Combined are $71 million lower mainly due to lower estimates of Canada Health and Social Transfers based on current funding formulas. This decrease is partially offset by higher-than-projected funding in 2018–19 for early learning and child care, transfers to Legal Aid Ontario and new funding for emergency treatment of opioid addiction. The combined net income for Ontario Power Generation Inc. (OPG) and Hydro One Ltd. (Hydro One) is $476 million below that indicated in the 2018 Fall Economic Statement. The decrease is primarily due to a recent regulatory decision by the Ontario Energy Board to uphold a decision on sharing tax savings related to the 2015 Hydro One Initial Public Offering (IPO) with ratepayers and to the costs associated with the termination of Hydro One’s acquisition of Avista Corporation. Net income from the Ontario Lottery and Gaming Corporation (OLG) is estimated to be $67 million higher than projected, largely due to the stronger than expected performance of the lottery business. Net income from the Liquor Control Board of Ontario (LCBO) is $27 million higher, reflecting an organization-wide initiative to achieve savings. $627 million in Recoveries of Prior-Year Expenditures are being recognized related to the recent arbitration settlement award regarding physician services. Fees, Donations and Other Revenues from Hospitals, School Boards and Colleges are $472 million higher, mainly reflecting increased revenues from international students’ tuition for colleges. The remainder of the increase in Other Non-Tax Revenue Combined of $179 million is mainly due to miscellaneous revenues from ministries and consolidated government agencies, such as Legal Aid Ontario, the General Real Estate Portfolio and the Transmission Corridor Program. Total expense is currently projected to be $162.5 billion, $744 million higher than forecast in the 2018 Fall Economic Statement. Growth in total expense is primarily the result of a $752 million increase to program expense due to investments in health care, postsecondary education and training, and support for municipal modernization efforts. , , , , ,  Expense change by sector, restated for fiscally neutral transfers of programs between sectors. Excludes changes to Teachers’ Pension Plan. Teachers’ Pension Plan expense changes are included in Other Programs. Health sector expense is projected to be higher by $480 million due to the recent arbitration settlement award regarding physician services, increased demand for cancer care services and Ontario Drug Benefit programs, as well as increased resources for addictions treatment and rehabilitation services. This is why the government is moving forward with transforming the health care sector through major sector-wide initiatives, such as establishing a new health agency, creating an integrated supply chain model, as well as streamlining transfer payment agreements and consolidating multiple service contracts. The government is reducing administration and back-office costs and focusing on ending hallway health care. Education sector expense is projected to be higher by $68 million, primarily due to the proposed Childcare Access and Relief from Expenses (CARE) tax credit, partially offset by lower-than-forecast school board spending. Following the largest public consultation on education in the Province’s history, the government is implementing stronger math, STEM, and financial literacy curricula, improved skilled trades opportunities and a provincewide ban on cellphones in the classroom for the students of today and tomorrow. Postsecondary Education and Training sector expense is projected to be higher by $640 million, primarily due to higher-than-forecast spending in colleges and increased expense in the Ontario Student Assistance Program (OSAP) resulting from the previous government’s unsustainable program design. Under that design, the number of people receiving financial aid was increasing faster than enrolment. Starting in the 2019–20 school year, the government is refocusing OSAP to ensure it remains sustainable for future students while directing a greater proportion of funding to families with the greatest financial need. Tuition rates will also be reduced by 10 per cent for funding-eligible programs for domestic students at every publicly assisted college and university. Children’s and Social Services sector expense is projected to be higher by $34 million, primarily due to higher-than-forecast social assistance costs. The government is reforming social assistance to provide more opportunities for recipients to achieve better outcomes such as overcoming barriers to employment. Justice sector expense is expected to be about $118 million higher, primarily due to capital repair and renewal costs, higher-than-expected awards for victim compensation, support for the public inquiry into the safety and security of residents in long-term care homes, and investments to combat gun- and gang-related violence. To ensure sustainability, the government is working across the justice sector to deliver improvements to Ontario’s justice sector that will reduce administrative costs to provide financial assistance to victims, and increase the use of technology to modernize business processes. This is part of the government’s strategy to modernize the justice sector making it more accessible, efficient and responsive to the needs of people across the province. $99 million in higher-than-forecast cultural media tax credits. These increases were more than offset by lower expense of $919 million as a result of changes in timing for federal infrastructure projects, along with the reduction of the contingency fund by $1,032 million. The government is projecting deficits of $10.3 billion in 2019–20, $6.8 billion in 2020–21 and $5.6 billion in 2021–22. The government is projecting a return to balance by 2023–24. For additional details on the government’s recovery plan, see Ontario’s Economic and Fiscal Outlook in Brief. Over the medium term, revenue is forecast to increase from $150.8 billion in 2018–19 to $163.7 billion in 2021–22, while total expense is projected to increase from $162.5 billion to $168.2 billion over the same period. The proposed Fiscal Sustainability, Transparency and Accountability Act, 2019 (FSTAA) would require the government to produce estimates of the major components of revenue and expense, and their underlying forecasts and assumptions. The taxation revenue forecast reflects growth in the economy and the impacts of government commitments. The primary economic driver of the forecast for Personal Income Tax (PIT) revenue is the outlook for growth in the compensation of employees. Between 2018–19 and 2021–22, PIT revenue is projected to grow at an average annual rate of 3.7 per cent per year. The outlook includes the impact of the Low-income Individuals and Families Tax (LIFT) Credit. For more information, see Annex: Details of Tax Measures. The Sales Tax revenue projection is based primarily on the outlook for growth in consumer spending. Sales Tax revenue is projected to grow at an average annual rate of 2.3 per cent between 2018–19 and 2021–22. The forecast for Corporations Tax (CT) revenue is driven by the annual growth projected in the net operating surplus of corporations. CT revenue is projected to grow at an average annual rate of 2.4 per cent between 2018–19 and 2021–22. The outlook includes the impact of the Ontario Job Creation Investment Incentive. For more information, see Annex: Details of Tax Measures. Ontario Health Premium revenue forecast is based primarily on the projected growth in the compensation of employees. Ontario Health Premium revenue is projected to increase at an average annual rate of 4.7 per cent between 2018–19 and 2021–22. Education Property Tax revenue is projected to increase at an average annual rate of 0.9 per cent between 2018–19 and 2021–22. This is largely due to growth in the property assessment base resulting from new construction activities. Revenues from All Other Taxes are projected to increase at an average annual rate of 1.2 per cent between 2018–19 and 2021–22, reflecting economic growth. This includes revenues from the Employer Health Tax, Land Transfer Tax, Beer, Wine and Spirits Taxes and volume-based taxes such as the Gasoline Tax, Fuel Tax and Tobacco Tax. Revenues from All Other Taxes include the impact of the pause in alcohol tax increases. The forecast for Government of Canada transfers is based on existing federal–provincial funding agreements and formulas, including the Canada Health Transfer, Canada Social Transfer, funding for labour market programs and Canada-Ontario community housing initiatives. The outlook for Income from Government Business Enterprises (GBEs) is based on Ontario Ministry of Finance estimates for Hydro One Ltd. (Hydro One) and projections provided by Ontario Power Generation (OPG), the Ontario Cannabis Store (OCS), the Liquor Control Board of Ontario (LCBO) and the Ontario Lottery and Gaming Corporation (OLG). Revenues from GBEs are projected to increase from $4.9 billion to $6.9 billion between 2018–19 and 2021–22. The forecast for Other Non-Tax Revenue is based on projections provided by government ministries and Provincial agencies. The outlook for Other Non-Tax revenues is projected to increase at an average annual rate of 0.6 per cent. This increase mainly reflects higher revenue to support the increasing costs associated with the delivery of related services. Estimates of cannabis-related revenue include Ontario’s portion of federal cannabis excise duty and the net income of the OCS. Ontario’s outlook for cannabis-related revenue reflects national cannabis supply shortages and the Province’s temporary measure of permitting up to 25 private cannabis retail stores to begin opening on April 1, 2019. The cannabis-related revenue outlook will change once the government has determined that the federal government has provided for enough reliable supply and further retail store authorizations are issued. The federal government imposes an excise duty on cannabis products sold by federally licensed producers, which is administered and collected by the Canada Revenue Agency. The Province receives 75 per cent of the federal excise duty collected on all cannabis intended for sale in Ontario as well as an additional 3.9 per cent on a producer’s selling price to account for the sales tax rate differentials across provinces and territories. The OCS sells cannabis to consumers age 19 and older through its retail website and is the exclusive wholesaler to private retailers in Ontario. The OCS net income forecast reflects initial costs for the development of its wholesale distribution channel. The proposed Fiscal Sustainability, Transparency and Accountability Act, 2019 (FSTAA) would require the government to present a comprehensive discussion of the risks that may have an impact on the economy or the public sector. The Province’s revenue outlook is based on reasonable assumptions about the pace of growth in Ontario’s economy. There are both positive and negative risks to the economic projections underlying the revenue forecast. Table 3.8 highlights some of the key sensitivities and risks to the fiscal plan that could arise from unexpected changes in economic conditions. These estimates are only guidelines; actual results will vary depending on the composition and interaction of various factors. The risks are those that could have the most material impact on the largest revenue sources. A broader range of additional risks are not included because they are either less material or difficult to quantify. Nominal GDP Total Taxation Revenue $705 million revenue change for each percentage point change in nominal GDP growth. Can vary significantly, depending on the composition and source of changes in GDP growth. Compensation of Employees Personal Income Tax, Ontario Health Premium and Employer Health Tax $460 million revenue change for each percentage point change in growth in compensation of employees. Housing Resales and Resale Prices Land Transfer Tax $28 million revenue change for each percentage point change in growth of either the number or prices of housing resales. Real GDP Fuel Tax $12 million revenue change for each percentage point change in real GDP growth. Ontario Population Share Canada Health Transfer $40 million revenue change for each one-tenth of a percentage point change in Ontario’s population share. Ontario Population Share Canada Social Transfer $15 million revenue change for each one-tenth of a percentage point change in Ontario’s population share. The Province’s program expense outlook is projected to grow from $150.0 billion in 2018–19 to $153.8 billion in 2021–22. This reflects the government’s commitment to invest in critical programs and services in health care, education and infrastructure. Prioritizing patients over processes to allow for critical investments in front-line health care delivery, including an annualized investment of approximately $90 million (once fully implemented) for a new dental program for seniors with low-incomes, targeted investments of $384 million in 2019–20 in the hospital sector to address hallway health care and approximately $1.75 billion in additional funding over five years in the long-term care sector to expand and improve bed capacity. Examining opportunities to enhance school board participation in formal buying consortia and group purchasing initiatives to leverage economies of scale. Making sustained investments in Ontario’s universities, colleges and employment and training programs, to ensure people have the training and skills they need to get good paying jobs. 2018–19 to $16.0 billion 2021–22 — representing an average annual decrease of 2.1 per cent over the period. The government is implementing social assistance reforms with the goal of achieving better outcomes for clients, reducing costs and administrative burden, and ensuring Social Assistance programs are more accountable to the people of Ontario. This includes transforming employment services through measures such as more effectively selecting system managers through a new competitive process. This will result in estimated annual savings of $720 million by 2021–22. The government will also modernize youth justice services, including the closure of underutilized youth justice facilities and reduction of beds in both the open and secure custody detention system as there is a continued trend of lower need for these services, leading to annual savings of $48 million by 2021–22. Other major sector-wide initiatives will target operational efficiencies and cost savings through evidence-based sector transformation estimated at $510 million annually in 2021–22. Evidence-based sector transformation, including in developmental services, child welfare, as well as special needs and early intervention programs, will allow the government to continue investments in core services such as in the Ontario Autism Program. Justice sector expense is expected to decrease from $5.0 billion in 2018–19 to $4.7 billion in 2021–22 — representing an average annual decrease of 2.0 per cent over the period. The Justice sector decrease is the result of modernizing and transforming the way services are delivered, while protecting front-line services. Generating back-office efficiencies by amalgamating adjudicative tribunals, saving up to $5 million annually in 2021–22. Other Programs sector expense is projected to increase from $24.6 billion in 2018–19 to $26.0 billion in 2021–22, representing an average annual increase of 1.8 per cent over the period. This growth is due to the increased cost of electricity price mitigation initiatives that will reduce electricity bills, projected increases in spending for broadband and cellular infrastructure, timing of municipal infrastructure projects and federal cost-matched infrastructure programs. This growth in expense is partially offset by lower spending on business supports and the elimination of programs funded by the previous cap-and-trade program. The total expense outlook includes interest on debt expense, which is projected to grow from $12.5 billion in 2018–19 to $14.4 billion in 2021–22 due to rising interest rate forecasts and increased debt levels. Table 3.10 provides a summary of key expense risks and sensitivities that could result from unexpected changes in economic conditions and program demands. A change in these factors could affect total expense and the public sector, causing variances in the overall fiscal forecast. These sensitivities are illustrative and can vary, depending on the nature and composition of potential risks. Hospitals Sector Expense includes funding from the Ministry of Health and Long-Term Care and a number of Provincial programs from other ministries, as well as other third-party revenues. Growth from 2018–19 Hospitals Sector Consolidated Interim Outlook Expense to 2019–20 Hospitals Sector Consolidated Plan. 2018–19 interim expense of $4,763.7 million versus 2019–20 multi-year plan expense of $4,638.9 million. Adjusted to exclude a one-time payment to physicians as part of the arbitration settlement award. Home Care statistics are based on 2017–18 actuals. In addition to the key demand sensitivities and economic risks to the fiscal plan, there are risks stemming from the government’s contingent liabilities. Whether these contingencies will result in actual liabilities for the Province is beyond the direct control of the government. Losses could result from legal settlements, defaults on projects, and loan and funding guarantees. Provisions for losses that are likely to occur and can be reasonably estimated are expensed and reported as liabilities in the Province’s financial statements. Any significant contingent liabilities related to the 2018–19 fiscal year will be disclosed as part of the Public Accounts of Ontario 2018–2019 to be released later this year. The proposed Fiscal Sustainability, Transparency and Accountability Act, 2019 would require Ontario’s fiscal plan to incorporate prudence in the form of a reserve to protect the outlook against unforeseen adverse changes in the Province’s revenue and expense. The reserve has been set at $1.0 billion in 2019–20, 2020–21 and 2021–22. Contingency funds are also maintained to help mitigate expense risks – for example, in cases where health and safety may be compromised — that may otherwise adversely affect Ontario’s fiscal performance. The contingency fund level is set at $1.1 billion in 2019–20. In keeping with sound fiscal practices, the Province’s revenue outlook is based on prudent economic assumptions, as discussed in Chapter 2: Economic Outlook. Includes income from Brampton Distribution Holdco Inc. for 2015–16 to 2016–17 from its interest in Hydro One Brampton Networks Inc.
On February 28, 2017, the Province sold its entire interest in Hydro One Brampton Networks Inc. and it is no longer included as a Government Business Enterprise. The Debt Retirement Charge cost was removed from residential electricity users’ electricity bills as of January 1, 2016 and for all other consumers as of April 1, 2018. Residual revenues recorded afterwards due to higher than expected amounts received following the 2017–18 year-end, compared to the estimated accrual amounts in 2017–18. Higher Sales and Rentals revenues in 2016–17 and 2017–18 compared to Interim 2018–19 and Plan 2019–20 are mainly due to significant, non-recurring asset sale initiatives such as the sale of Hydro One shares. Declining Carbon Allowance Proceeds reflects the passing of the Cap and Trade Cancellation Act, 2018 on October 31, 2018. The Province is committed to making rural Ontario and Ontario’s agri-food sector open for business and open for jobs. The Province will do this by cutting red tape, investing in key programs like the Risk Management Program, fighting for supply-managed commodities on the world stage and recognizing farmers as the best stewards of their land. The government is working to simplify a complex and antiquated justice system. This will make it easier, faster and more efficient for the people of Ontario to access justice. Improvements to the justice sector can save money. By modernizing outdated practices and making strategic investments, the Province can reduce regulatory burdens, improve the reliability of the justice system and get criminals off the street faster. As part of broader justice sector transformation, the Province will continue to get the basics right through reforms such as reducing the use of civil juries in simplified procedure trials, updating the Province’s victim compensation rules and eliminating juries for more minor offences. A faster, more efficient justice sector means the Province saves time and money while delivering better results for all of the people of Ontario. The Ministry of Children, Community and Social Services will modernize its service delivery by reducing red tape, streamlining internal services and providing more opportunities to access services online. The Province is continuing to make social assistance a more effective and sustainable program that will help people return to work and achieve better outcomes. This approach is fixing the ineffective, disjointed patchwork of supports that traps people and denies them meaningful opportunities to find jobs and get their lives back on track. The best social program is a job, for those who can get one. The Province will also support improved integration of human services, focusing on better outcomes for people, more efficient systems and reduced administrative burden. The Province is focused on making Ontario more attractive for investment, job creators and talent. The government’s job is to ensure that it is getting the basics right by measuring outcomes whenever taxpayer dollars are spent on business support programs. The Province is focused on creating the conditions for growth, and cutting the red tape that is impairing the ability for business to create good jobs across the province. The Province is cutting red tape and reducing business costs so that job creators across sectors — including those in the auto sector — can continue to grow and thrive right here in Ontario. The government has made critical investments through its automotive plan Driving Prosperity: The Future of Ontario’s Automotive Sector. These investments are about being strategic, leveraging collective resources and collaborating for the future. The Ministry is committed to getting value for money from academic and other research institutions by consolidating and strengthening its policy and research capacity. Support will be targeted at those organizations that provide benefits for all of the people of Ontario. The Ministry will modernize its programs by assessing their relevance in driving economic growth in areas of investment attraction, research and commercialization, entrepreneurship and talent, with a focus on supporting job creation and business growth. The Ministry will ensure that Ontario’s interests are well represented in all trade matters and negotiations to support the growth of new jobs and investment in Ontario. In addition, the Ministry will streamline Ontario’s international presence to increase value for money and focus on the global markets that offer the most opportunity for investment attraction and trade promotion. Getting back to basics, respecting parents and working with teachers to ensure that children have the skills they need to succeed — an education system that is truly built for families. Upon taking office, the government launched the largest public consultation on education in Ontario’s history. Through 72,000 engagements, parents, educators, students and employers identified concerns and offered a plan for change. Broadband access will be expanded throughout the province. Ontario will consult with education partners prior to the next school year on a plan to increase class sizes in other grades to reflect the experience in other provinces. By protecting what matters most, the government is preserving a modern and sustainable public education system that respects parents and focuses resources on the tools educators need to do their jobs and help children find meaningful employment in the modern economy. The Province continues to fix expensive and confusing electricity programs and is creating an energy system that works for Ontario’s families, farms and small businesses. The Province is committed to making electricity bills more transparent and to lowering electricity costs for residential, farm and small business customers by 12 per cent. As a result of this transparency, the full fiscal costs of rate mitigation are reflected in the government’s books. The Province will view all decisions on electricity through the lens of reducing costs. For example, the government plans to refocus and centralize the delivery of conservation programs to save electricity customers and taxpayers up to $442 million over the next three years. The Province will continue to put Northern Ontario at the forefront of Ontario’s Plan for the People and help ensure these communities can improve their competitiveness and attract new mining investments. The government’s made-in-Ontario plan commits to keeping Ontario beautiful by protecting its air, land and water while preventing and reducing litter and waste in communities. The government will support Ontario families as they continue to do their part to reduce greenhouse gas emissions, and work with local communities and families to prepare for the effects of climate change. As part of the plan to reduce costs for Ontario families and businesses, the Province took immediate action to end the cap‐and‐trade carbon tax. By not proceeding with previously planned spending related to the cap-and-trade carbon tax, the Province has provided relief for Ontario residents and small businesses, which is reflected in a reduced 2019–20 expense. The government’s plan will use sensible and pragmatic solutions to balance a healthy environment with a healthy economy and focus on what matters most to the people of Ontario. The Province is restoring confidence in Ontario’s finances and bringing jobs and growth back to this province, so that it can protect what matters most — hospitals, schools and other vital public services — for this generation and the next. It is also treating the people of Ontario like adults when it comes to choice and convenience for purchasing alcohol and online gambling. The Ministry supports effective stewardship of the government’s finances as well as a dynamic, innovative and growing economy across five core lines of business: fiscal, tax and economic policy, revenue collection, managing the debt, intergovernmental fiscal relations and financial regulation. The Ministry has a plan to better support economic growth and jobs, cut red tape, deliver better value for money and let people keep more of their hard-earned money. It will do this by: ensuring that spending is directed to the highest priority needs while reducing the debt burden; by making sure that the tax system is efficient and competitive; by enabling accurate tax assessment and targeted enforcement; by working with the federal government so that transfers to the Province are adequate and rationalized; and by using a modern and risk-based approach to regulating the financial services sector. To ensure the vitality of Ontario’s Francophonie, the government is working to create conditions conducive to the growth of the economy, the influence of Franco-Ontarian culture, and the vitality of Francophone communities. The government is committed to improving access to services in French for the 1.5 million Ontarians who speak French. The Province will respect the importance of traditional Francophone institutions by protecting the core program funding of the Ministry and instead focus efforts on reducing back-office administrative inefficiencies. For far too long, out-of-date, overly bureaucratic processes have reduced the quality of government services provided to the people of Ontario. This is why the government is transforming services in a way that puts the people at the centre of everything it does. The government is delivering simpler, faster and better services, improving transparency and strengthening consumer protections. Following the recommendations from EY Canada’s line-by-line review, the Province is adopting a “digital-first” mindset to modernize its back-office and front-line services. By embracing technology, the Province will focus on improving the customer experience. Customer service is not just a mantra, it is about putting people back at the centre of government and having government work for the people. Working with the Treasury Board Secretariat, the Ministry will fix long outdated back-office functions and centralize procurement across the Ontario Public Service and broader public sector. Savings realized through the Ministry’s work include: more than $80 million over 10 years on mobile devices; more than $80 million over five years on office furniture; more than $70 million over seven years on courier services; and more than $15 million over five years on managed print services. Every part of the government’s plan to end hallway health care and build a modern, sustainable and integrated health care system, starts with the patient. Today, the system is disconnected, leaving it up to patients and families to figure it out on their own. This fragmented approach to care is failing Ontario’s families and, in particular, seniors. Together, the Province will create a connected system of care in which every Ontarian is truly supported throughout their health care journey. The government is committed to ending hallway health care. Today, the health care system is facing capacity pressures and it does not have the right mix of services, beds or digital tools to be ready for a growing and rapidly aging population with more complex care needs. The Province is making critical investments and increasing the Ministry’s overall budget by $1.4 billion by making investments in new hospitals and hospital upgrades, a dental plan for low-income seniors and a historic investment in mental health. At the same time, the Province is protecting what matters most in health care by targeting its existing resources. For example, the Province fixed the OHIP+ program by focusing benefits on those who do not have existing prescription drug benefits. Those who have private insurance will access prescribed medicines through their private plan, while those who do not will continue to receive their eligible prescriptions through OHIP+. The people of Ontario have always been, and will always be, the government’s priority and focus; the government will create a public health care system that works for everyone. The Ministry of Indigenous Affairs develops stronger partnerships with Indigenous people in Ontario by working with Indigenous people and communities to support economic and resource development, negotiate land claims, and spearheading cross-government initiatives that improve economic and social outcomes for Indigenous people. The Ministry has met Ontario’s legal obligations for Indigenous treaty rights, such as the Williams Treaties First Nations, by settling these claims and by recognizing expected upcoming contingent liabilities for future claims, which explains the large expenses incurred in 2017–18. The Ministry works to promote collaboration and coordination across ministries on Indigenous policy and programs in partnership with First Nations, Métis and Inuit. One of the highest ongoing priorities is to encourage economic opportunities for Indigenous peoples with the goal to improve the quality of life of Indigenous Ontarians. The Province will target its support on those investments that best improve the economic opportunities for Indigenous peoples of Ontario. Ontario’s Government for the People is committed to maximizing the province’s infrastructure and infrastructure investments to benefit all of the people of Ontario. Whether it is building new or making key investments to upgrade Ontario’s schools, hospitals, roads, bridges and transit, the Province needs to make strategic investments efficiently across government by prioritizing infrastructure activities and unlocking existing opportunities. For example, in 2019–20 the Ministry is taking steps to leverage the expertise of Infrastructure Ontario to consult on projects for a fee, potentially generating opportunities for the Province that it can reinvest into critical infrastructure such as roads and bridges. Ontario strives to be the best jurisdiction in North America to recruit, retain and reward workers for the jobs of today and tomorrow. The Province will create dynamic labour markets and safe workplaces, with fair and competitive labour and employment regulations. The Province will modernize and streamline compliance with the Employment Standards Act. The Ministry will develop automated digital tools to help employers educate themselves to be self-reliant on understanding their obligations under the Employment Standards Act. This will reduce duplication and administrative burden on employers. Front-line workers at the Ministry of Labour will be able to focus on high-risk, high-impact investigations and claims resolution. The result will be savings for the government and employers, and safer workplaces for employees. All of the people of Ontario can find a home that meets their needs and their budget. The Province will partner with municipalities to ensure that they are working as effectively and efficiently as possible to support the economic prosperity of their residents and businesses. The Province is modernizing the way that government works. To achieve this, the government has committed to supporting municipalities so that they have the resources they need to modernize their governments and create efficiencies. For that reason, the Province provided $200 million in one-time financial support in 2018–19 for financially constrained small and rural municipalities. A part of protecting what matters most is providing for affordable homes and responsible planning. Ontario needs more community housing supply — there are too many low-income people waiting for help to find housing they can afford. The government is leveraging federal, municipal and provincial support to provide more affordable housing for the Province’s Community Housing Renewal Strategy, which will address waitlist issues for community housing and ensure that the people most in need of community housing get access first. Ontario’s Housing Supply Action Plan will bring forward solutions to make it faster and easier to build housing, to help boost housing supply and make housing more affordable. The plan will be flexible so that each community can build what it needs while protecting sensitive areas like the Greenbelt, preserving cultural heritage and maintaining Ontario’s vibrant agricultural sector. Living in Ontario means having the ability to fish, hunt and enjoy world-class outdoor recreation opportunities. It is the Province’s duty to promote these activities and the economic opportunities they offer while continuing to be a world leader in managing Ontario’s natural environment for generations to come. The Province will refocus the Ministry on its core mandate, which is to develop and support Ontario’s natural resource and forestry sectors. The Ministry will modernize and focus on service delivery and customer service while rationalizing its organizational structure and operations to be more efficient and cost effective. By protecting what matters most, the Ministry will continue to invest in its capital assets, such as buildings, dams, aircraft and fleet. Ontario’s seniors have built this province. They paid taxes for generations and worked hard to support the necessary investments in highways, bridges, schools and hospitals. At the same time, there is an important duty to make the province more accessible and remove barriers for people with disabilities. The Province is leaving core Ministry programs fully intact, with the savings achieved in part through back-office efficiencies, inter-office savings, and directing certain advertising campaigns to cheaper online methods. Ensuring the safety and security of the people is the government’s most fundamental responsibility. The people of Ontario owe a debt of gratitude to the heroes on the front lines — including police, firefighters and correctional service staff. Their efforts protect families and keep communities safe. These heroes have Ontario’s back, and the government has theirs. Ontario’s Government for the People is taking a people-first approach to tourism, culture and sport. Working with agencies, community partners and businesses, the government will make strategic investments to embrace and showcase Ontario’s heritage and attractions, create conditions for Ontario to be the destination of choice for tourists, and be the best place to play and be an athlete. Investments will provide economic opportunity and prosperity to the people of Ontario. The government will modernize and review granting programs, such as the Ontario Trillium Foundation, the Ontario Arts Council and the Ontario Music Fund to make sure that funding is targeted and administered efficiently, delivering the best outcomes for the people. The government will continue to make investments in the tourism, culture and sport sectors and its agencies, ensuring Ontario is open for business and open for visitors. The government wants all of the people of Ontario to have the skills they need to get a good job. The Ministry of Training, Colleges and Universities is dedicated to making Ontario’s postsecondary education system more sustainable and better aligned with labour-market needs while operating transparently and efficiently. The Ministry is committed to providing job seekers with the opportunities and training needed to find and keep good jobs and giving employers the ability to find the skilled workers needed to thrive and restore Ontario to its rightful place as the economic driver of Canada. The Ministry is modernizing and transforming the skilled trades and apprenticeship system to create more opportunities for apprentices and employers, expand the portability of skills and reduce the regulatory burden on businesses and employers to bring quality jobs back to Ontario. The Province is keeping its promise to build better public transit — delivering more transit services faster — and to save taxpayer dollars by forging new partnerships. The government is improving the transit experience and making life easier for the people of Ontario. For decades, governments have promised new transit investments, but they failed to deliver. Getting transit built means taking a bold leadership position to upload the Toronto Transit Commission’s subway network, holding the federal government to its commitment to contributing dedicated funds to support priority projects and finally getting shovels in the ground to build important subway projects. The Province will work with municipalities to build the transportation infrastructure that will best serve the needs of communities. Investments in roads, bridges and highways are creating a truly integrated and safe transportation system across the province. The government recently showed its commitment to making life more affordable for families, by announcing that children under 12 years of age can travel free of charge on GO Transit. The Province is finding more ways to build transit infrastructure. The Transit Oriented Development strategy will see more housing and workplaces built along transit lines. The government is making historic new investments in transit to help people get around faster and easier. Treasury Board will continue to play a crucial role in delivering good government and sustainable public services in the most effective and efficient way possible. It will do this by strategically driving cultural change and embedding a focus on fiscal responsibility across the whole of government. Treasury Board will continue to spearhead the review and analysis of all government programs and services by ensuring evidence-based decision making, effective outcomes and value for money while protecting what matters most. The Ministry will continue to deliver on its core mandate with a strengthened internal audit function through the Audit and Accountability Committee, ongoing program and agency reviews to find efficiencies and improve outcomes for the people of Ontario, and prudent leadership in labour relations with its Ontario Public Service and broader public-sector partners. The Province has put in place a prudent Operating and Capital Contingency Fund housed in the Treasury Board Secretariat. This fund is the main driver of the increase in the Ministry’s 2019–20 budget, in addition to an increase in employee pension benefits paid. Numbers reflect current ministry structure. , , , , , , , , , , , , , , , , , , , , ,  Interim represents the 2019 Ontario Budget projection for the 2018–19 fiscal year. ,  Numbers reflect the pension expense that was calculated based on recommendations of the Independent Financial Commission of Inquiry, as described in Note 19 to the Consolidated Financial Statements in Public Accounts of Ontario 2017–2018. A liability is recorded if the settlement of the claim is assessed as likely and the amount of the settlement can be reasonably estimated. Interest on debt is net of interest capitalized during construction of tangible capital assets of $159 million in 2016–17, $157 million in 2017–18, $325 million in 2018–19 and $489 million in 2019–20. Includes Provincial investment in capital assets of $11.9 billion. Includes interest capitalized during construction of $489 million. Other Partner Funding refers to third-party investments in hospitals, colleges and schools. Includes Federal/Municipal contributions to provincial infrastructure investments. Amounts reflect a change in pension expense that was calculated based on recommendations of the Independent Financial Commission of Inquiry, as described in Note 19 to the Consolidated Financial Statements, in Public Accounts of Ontario 2017–2018. Amounts for net debt and accumulated deficit also reflect this change. Revenues and expenses have been restated to reflect the following fiscally neutral changes: i) revised presentation of education property taxes to be included in the taxation revenues; ii) reclassification of certain Government Business Enterprises to other government organizations; iii) reclassification of a number of tax measures that provide a financial benefit through the tax system to be reported as expenses; and iv) change in presentation of third-party revenue for hospitals, school boards and colleges to be reported as revenue. Population figures are for July 1 of the fiscal year indicated (i.e., for 2010­–11, the population on July 1, 2010 is shown). 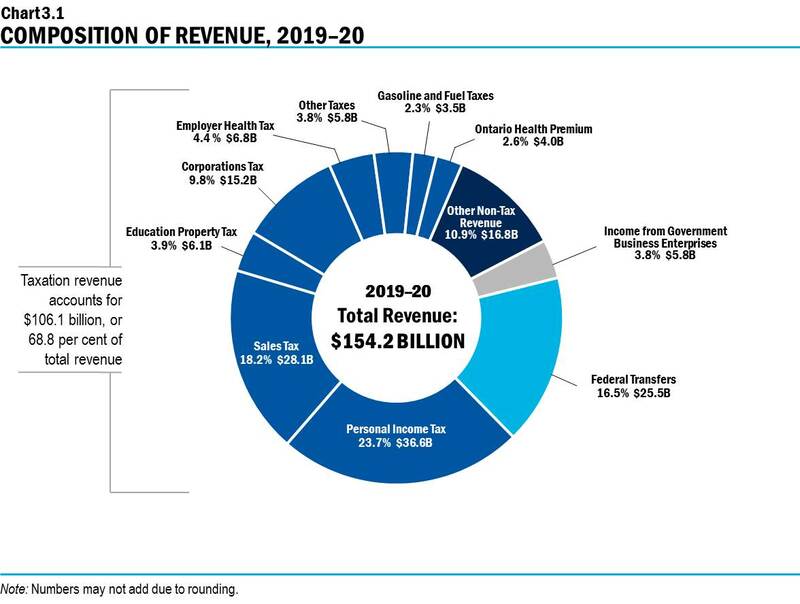 This pie chart shows the composition of Ontario’s revenue in 2019–20, which totals $154.2 billion. The largest taxation revenue source is Personal Income Tax revenue at $36.6 billion, accounting for 23.7 per cent of total revenue. This is followed by Sales Tax at $28.1 billion, or 18.2 per cent of total revenue; and Corporations Tax at $15.2 billion, or 9.8 per cent of total revenue. Other components of taxation revenue include Education Property Tax at $6.1 billion, or 3.9 per cent of total revenue; Employer Health Tax at $6.8 billion, or 4.4 per cent; Gasoline and Fuel Taxes at $3.5 billion, or 2.3 per cent; the Ontario Health Premium at $4.0 billion, or 2.6 per cent; and Other Taxes at $5.8 billion, or 3.8 per cent of total revenue. Total taxation revenue accounts for $106.1 billion, or 68.8 per cent of total revenue. The other major non-taxation sources of revenue are Federal Transfers of $25.5 billion, or 16.5 per cent of total revenue; Income from Government Business Enterprises at $5.8 billion, or 3.8 per cent of total revenue; and various Other Non-Tax Revenue at $16.8 billion, or 10.9 per cent of total revenue. 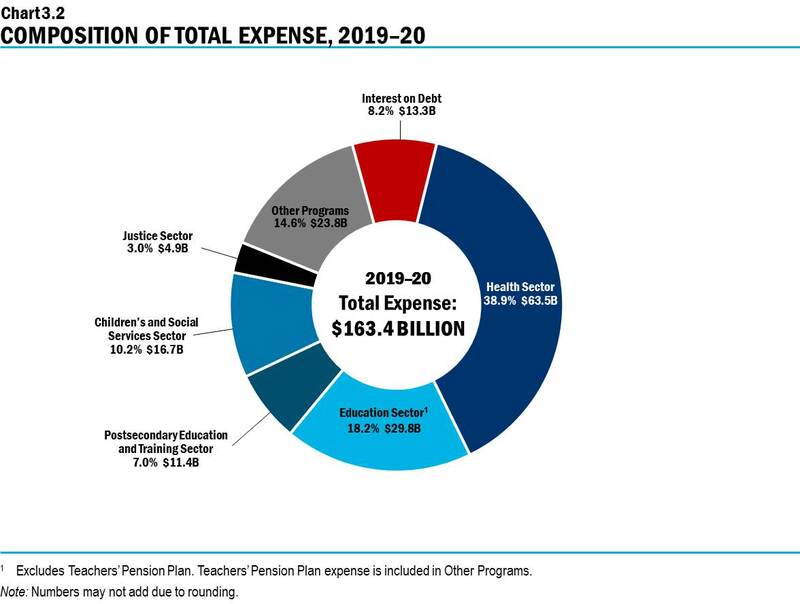 This pie chart shows the share of Ontario’s total expense and dollar amounts by sector in 2019–20. Total expense in 2019–20 is $163.4 billion. The largest expense is the Health Sector at $63.5 billion, accounting for 38.9 per cent of total expense. This pie chart Excludes Teachers' Pension Plan. Teachers' Pension Plan expense is including in Other Programs. To ensure consistency and comparability of numbers between the current outlook, the Commission’s baseline forecast and prior year results, the Commission’s Net Debt as a Per Cent of GDP estimate was revised from 40.5 per cent to 40.8 per cent in the 2018 Ontario Economic Outlook and Fiscal Review.